There are many technologies for microservices. 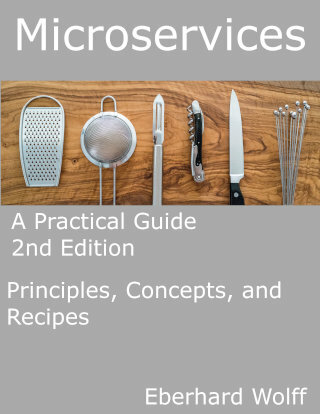 This book shows the basics of microservices, the concepts of the most important technologies and finally concrete recipes with technologies such as client-side and server-side frontend integration, asynchronous microservices with Kafka or REST/Atom, synchronous systems with the Netflix stack and Consul or microservices platforms with Kubernetes and Cloud Foundry. In addition, there is the operation with monitoring with Prometheus, log analysis with the Elastic stack and tracing with Zipkin. The book thus offers a good start implementing microservices. The book is a translation into English. The German version is Microservices Praxisbuch. Eberhard Wolff has 15+ years of experience as architect and consultant - often at the intersection of business and technology. He is a Fellow at INNOQ in Germany. He has given talks at international conferences and written more than 100 articles and books e.g. about Microservices and Continuous Delivery. His technological focus is on modern architectures - involving Cloud, Continuous Delivery, DevOps, Microservices or NoSQL.